Please join us for a “Trail Day” tour to observe progress on the I-91 bridge demolition, hosted by PCL and FIGG, the construction and design companies for the bridge. Date and time: Saturday, December 14, 8:00 AM. Meet at the Marina kiosk. All welcome! The PCL+FIGG Team will conduct the first on-site “Trail Talk” for the Public on Saturday, December 14, 2013. 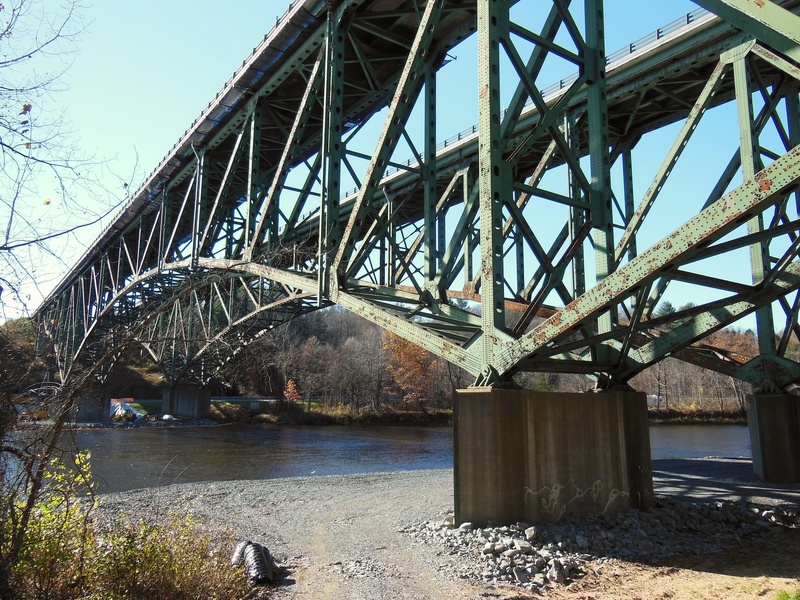 These trail talks will discuss the status of the I-91 Brattleboro Bridge Project and will provide participants the opportunity to learn about the construction and ask questions. The talks will originate at the West River Trail near the marina. The first trail talk will be led by Caleb Linn, Project Manager for PCL (lead contractor), and Garrett Hoffman, Design Manager for FIGG (bridge designer). Interested participants should meet the PCL+FIGG Team at the West River Trail trailhead at the Marina on Saturday, December 14, 2013, at 8 a.m. The talk will begin at 8:15 a.m. Participants will walk the trail to the I-91 bridge site, so please wear appropriate clothing and footwear. The project’s website features up-to-date information about the project, construction photos, and live traffic cameras. If you would like additional information, or would like to be added to an email distribution list for all project updates, please contact Cindy Cook, Public Relations Officer, Adamant Accord, Inc. ccook@adamantaccord.com. This entry was posted in lower section, west river trail and tagged I-91 bridge construction, trail day tour, west river trail, west river trail construction updates. Bookmark the permalink.